Melanoma is the most serious form of skin cancer. However, if it’s recognized and treated early, it is nearly 100 percent curable. But if it is not, the cancer can advance and spread to other parts of the body, where it becomes hard to treat and can be fatal. Melanoma is a malignant tumor that originates in melanocytes, the cells which produce the pigment melanin that colors our skin, hair, and eyes. The majority of melanomas are black or brown. However, some melanomas are skin-colored, pink, red, purple, blue or white. Look for the ABCDEs of melanoma, and if you see one or more, make an appointment with a physician immediately. If you draw a line through this mole, the two halves will not match in size, shape, color, or thickness. The borders of an early melanoma tend to be uneven. The edges may be scalloped, notched. Ragged, or poorly defined. Having a variety of colors is another warning signal. A number of different shades of brown, tan or black could appear. A melanoma may also become red, blue or some other color. Melanomas usually are larger in diameter than the size of the eraser on your pencil (1/4 inch or 6 mm), but they may sometimes be smaller when first detected. 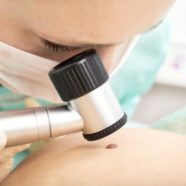 If you notice a mole different from others that itches, changes, or bleeds you should contact your dermatologist. Any change – in size, shape, color, elevation, or another trait, or any new symptom such as bleeding, itching or crusting – points to danger.